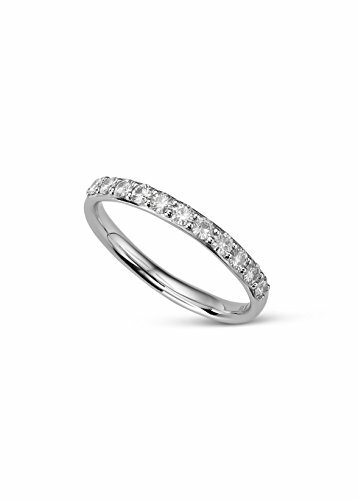 Whether wearing as a stacker or by itself, pave Charles & Colvard Created Forever Classic Moissanite stones wrap halfway around this sterling silver band.Total Diamond Equivalent Weight (DEW) is 0.44cttw, Actual weight is 0.418cttw. Ring size 7. Whether wearing as a stacker or by itself, pav Charles & Colvard Created Forever Classic Moissanite stones wrap halfway around this sterling silver band. Total Diamond Equivalent Weight (DEW) is 0.44cttw, Actual weight is 0.418cttw.